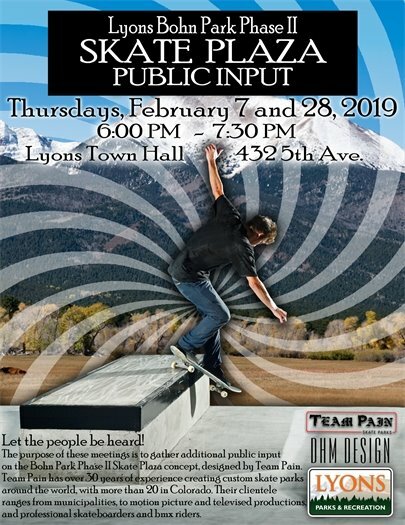 Join Team Pain, DHM, and Town officials on February 7 and 28, to discuss the Bohn Park Phase II Skate Plaza and offer input into its design. 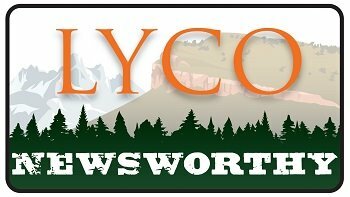 Each meeting will take place from 6:00 to 7:30 p.m., in the Lyons Town Hall Board Room. On February 7, the design team will provide information on the 2016 Parks Flood Recovery Planning Process, which included initial public input and planning for the Bohn Park skatepark. Attendees will be provided the background on how the plan was refined, various constraints, review of current concept, and will be given the opportunity to provide public input. On February 28, the team will present refined concept(s), and discuss the project's schedule. Team Pain, the contractor awarded the Bohn Park Phase II Skate Plaza project, is a Florida-based skate park specialist, who has over 30 years of experience creating custom skate parks and skate structures around the world. Team Pain has worked for municipal and government agencies, private sector, production companies for motion picture and televised events, and professional skateboarders and bmx riders. They have built more than 20 skateparks in Colorado.